Did you know if you’re a student at The College of Animal Welfare you may be entitled to apply for a TOTUM card? 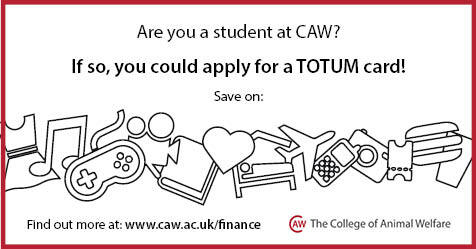 Please call us on 01480 422060 / admin@caw.ac.uk to find out if you are eligible to apply for a TOTUM Card and to receive a Voucher Code needed to apply. You can then click here to start your application!